The 2011 XXL Magazine Freshman Cover has been leaked. Shout out to all the young up and comers that made the cover. As a side note, we spotted Diggy Simmons rocking his ZShock Shockra bracelets on this auspicious magazine cover. Shout out to Diggy. We are also sure that Li'l Twist and Mac Miller were also sporting their iced out G-Shocks by ZShock, but they don't seem to be visible in this particular shot. Either way, it's the second annual XXL Freshman Cover where ZShock was represented. 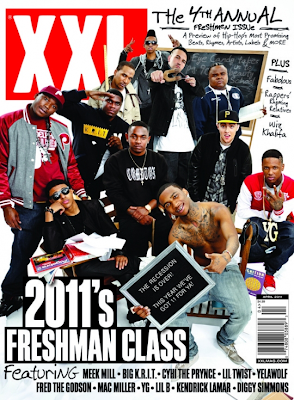 The 2010 Cover had Big Sean wearing his ZShock as well. Get with Team ZShock today and pick up your ZShock gear. Shout out to NFL'er Rashad Butler, who plays for the Houston Texans. Rashad is a homie from South Florida and an Alumni of the 2001 National Champions University Of Miami Hurricanes. 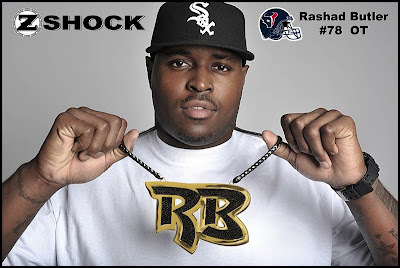 Rashad is also an official V.I.P member of Team ZShock and has countless custom pieces of jewelry and watches from ZShock. Rashad's most recent piece he commissioned was an iced out version of his RB 2Cool logo. The piece is designed with the color focus on Black & Yellow. Rashad is another testiment that real "Players" get I.C.E.D. by ZShock! For your custom piece, head over to ZShock and contact us via e-mail or call ZShock toll free at 1-877-7ZSHOCK and get to ZShock'n!